The Department of Anesthesiology provides a variety of formal and informal educational opportunities for its members. We believe strongly that diversity in the pursuit of education allows our fellows to mature in both their professional and personal lives. The Pediatric faculty and fellows hold three to six Journal Clubs each year. Interested residents or those rotating on the Pediatric Anesthesia block are asked to participate. Morning conferences are held four to five days a week. Monday: M & M Session Monthly, 6:45 to 7:15 a.m. Chair’s Conference Monthly, 6:45 to 7:15 a.m.
Wednesday: Departmental Grand Rounds or M & M, 7:00 to 8:00 a.m.
Thursday: Self Directed Study 6:45 to 7:15 a.m.
Friday: Pediatric Anesthesia Conference, 6:30 a.m. to 7:00 a.m. (two Fridays per month) & 1st Friday Fellow Small Group Sessions, 6:30 to 7:00 a.m. The fellows are expected to attend these conferences on a regular basis. Each fellow will be expected to present a topic of interest for one of the Friday morning conferences and to participate in 1st Friday Fellow Small Group. In addition, pediatric anesthesia fellows will present at Division M & M Conferences once per year. Pediatric Cath Conference is held Mondays from 4:30 to 5:30 p.m. and fellows are encouraged to participate. Yearly, a six to eight week interactive oral board course is offered to the fellows in the evenings in the Winter leading up to the oral board exam. This is led by various members of the faculty in each anesthesia subspecialty, and also includes faculty who are national oral board examiners. We have nine oral board examiners in the department. All fellows have ready access to intra-departmental, campus-wide and Internet computer facilities to assist with literature searches, research activities, lecture presentations, and self-paced programmed education. A fellows’ office, immediately adjacent to the operating rooms, is equipped with a study carrel and a computer for each fellow. Our library maintains an up-to-date collection of computer assisted interactive educational software programs. On our internal website we have rotation goals and objectives, educational material, pertinent journal articles and clinical guidelines. Computer facilities are available 24 hours a day to allow fellows free access to the latest methods of education in anesthesia. The department has a staff of computer specialists with expertise in educational software, word processing, data storage and retrieval, statistical analysis, and multimedia presentation techniques. Fellows are encouraged to utilize these facilities to assist in research endeavors and to supplement the more traditional didactic and clinically based educational experiences. The department has collaborated with the UNC Health Sciences Library to develop the Sugioka Library and Educational Resource Center. The “electronic” library provides access to all major English language Anesthesiology, Critical Care and Pain Medicine journals and electronic textbooks. Links from this page and others from our website allows access to multiple educational resources including PubMed, Cochrane Library, MD consult and Up To Date. Our physical Anesthesia Library maintains a set of core text books, multiple computer stations and comfortable reading areas. In addition, the fellows will have access to our satellite office/workroom next to the children’s operation rooms and will have newly renovated office space in the children’s hospital. The Health Sciences Library is located in close proximity to the UNC hospitals complex. The library contains 448,316 total volumes and receives 8,186 serial titles. Electronic journals and books and databases such as PubMed, CINAHL, ISI Citation Databases, BIOSIS, PsychINFO, eFacts, and Lexi-Comp are available anywhere on campus. Faculty, staff, and students can access almost all electronic resources from home. A total renovation of the library building was completed in early 2005, adding high end technology options, group study spaces, and a coffee shop. Fellows will participate in various workshops throughout the year. Examples of workshops include Ultrasound guided regional anesthesia and wellness workshops. This curriculum varies from year to year. 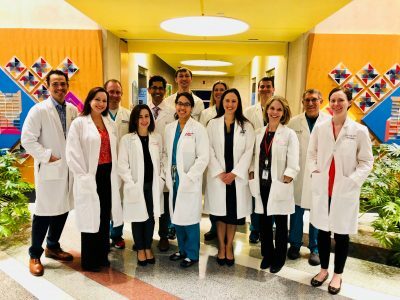 The division of Pediatric Anesthesia offers two mandatory simulation bootcamps each academic year with a focus on pediatric crisis management, communication, teamwork, and systems based practice. This course is offered in conjunction with the faculty from our UNC School of Medicine Simulation Center.